The color was chosen in recognition of the impact of September 11, attacks. 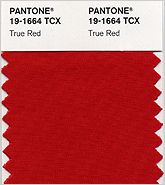 This red is a deep shade and is a meaningful and patriotic hue. Red is known as a color of power and/or passion and is thus associated with love.